Certified Angus Beef has taken another step to solidify its position as the gold standard in branded beef programs with the formal opening this month of an Education and Culinary Center adjacent to its headquarters in Wooster, Ohio. CAB invited members of the ag trade media, includinig Ron Hays of the Radio Oklahoma Network and OklahomaFarmReport, as well as Food Writers from several major consumer markets to take part in the opening weekend. 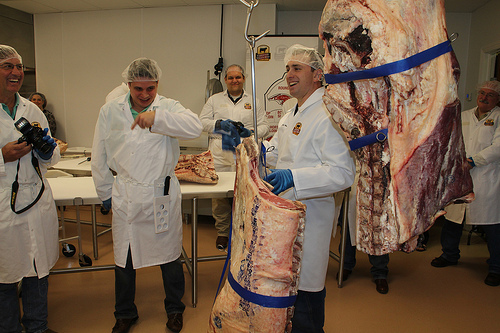 Media were taken in the cooler room which can serve as a teaching point about beef carcasses, how they are broken down to primals, subprimals and eventually retail cuts. CAB professional staff actually took the media present through taking apart the Loin of a beef carcass, ending up with key cuts like the Tri-Tip, the Porterhouse and more on the cutting room tables. Joining the staff and media were several members of the Certified Angus Beef Board of Directors, which includes John Pfeiffer of Mulhall, Oklahoma. This Oklahoma Angus breeder has been on the CAB for about a year and a half of a three year term, and was very excited about what the impact this Education and Culinary Center can mean to the Angus breed. In a special digital edition of the Beef Bizz, you can hear our full conversation with John as we talked with him on Saturday in Wooster, Ohio during this event. Topics we covered included his cattle pedigree in the Angus business, the early days of CAB and how this beef brand has meant value back to Angus cattle producers. We also have pictures from the weekend up on our Flickr page- click here to see our set of photos of our meat cutting session, some great looking Angus cattle and more. Ron Hays Beef Buzzes with John Pfeiffer of the CAB Board about the latest efforts of the CAB to advance their brand.